HomePoliticsUK PoliticsWhere have the far-right gone? In the European Elections last year, far-right groups across Europe made unprecedented electoral breakthroughs. Marine Le Pen’s National Front stormed to victory, winning 26% of the popular vote in what the French Prime Minister Manuel Valls described as a ‘political earthquake’. The far-right Danish People’s Party enjoyed similar success, topping the national poll at 27%. More or less openly neo-Nazi parties sent MEPs to Brussels for the first time, with Germany’s National Democratic Party and the Greece’s Golden Dawn winning 1 and 3 seats respectively. In the UK however, the far-right British National Party was obliterated despite having two MEPs elected in 2009. Its share of the popular vote shrunk to 1.14%, and it’s now unable to find enough candidates to qualify for a 2015 General Election broadcast. Other far-right groups in the UK have also faded into obscurity. The English Defence League, which once mobilised thousands of supporters in violent street protests across the country, has fractured into disorganised local groups. The BNP and EDL’s spiritual successor, Britain First, has failed to achieve anything tangible despite an impressive social media presence. Although competent keyboard warriors, marches organised by Britain First fail to attract more than 50 people, and its parliamentary candidate Jayda Fransen was beaten in the Rochester and Strood by-election by the Monster Raving Loony Party. As the annual report by far-right watchdog Hope Not Hate suggests, the far-right in the UK are weaker than they’ve been for 20 years. So where have the far-right in the UK gone today? With the Rotherham grooming scandal, the Charlie Hebdo shootings, the threat of ISIS, public outcry over immigration, faltering public confidence in the political establishment, and glaring inequality providing them with an arsenal of causes to rally around, why have they remained dormant? To some degree, the electorally successful UKIP has occupied the vacuum left by defunct far-right organisations. 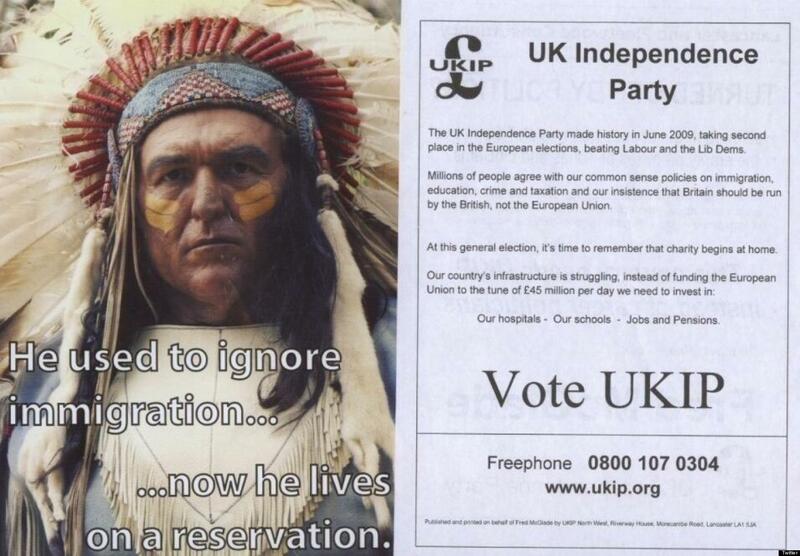 In a push for electability, UKIP has gone to great lengths to distance itself from the far-right. A leaflet like this, used in 2010, certainly wouldn’t feature in its current branding strategy. Indeed, it shunned Le Pen’s Front National in the EU for being too prejudiced and anti-Semitic, it has an explicit ban on recruiting ex-BNP members into its ranks, and Nigel Farage currently has a policy of ‘weeding out’ candidates who have said things that ‘err towards racism’. On a policy buy neurontin online pharmacy level, UKIP certainly shares more with the conservative right than it does with fascists. Despite this, one can see why, as the Hope Not Hate report suggests, “most former BNP voters feel quite at home in the UKIP stable”. For starters, the sheer number of outrageous public comments coming from current and former UKIP candidates and representatives indicates that bigotry is endemic within the party. Protests about sending aid to ‘Bongo Bongo Land’, the dislike of people with ‘negroid features’, the linking of floods to the legalisation of gay marriage, and this charming man are but a handful of examples that immediately spring to mind. UKIP also has an array of dubious partners in its European parliamentary group, from holocaust denier Robert Iwaszkiewicz MEP to the Swedish Democrats (founded by white supremacists who wore Nazi uniforms to their meetings). While UKIP has broadened its appeal lately, it still receives support from the likes of Britain First and Nick Griffin. The dormancy of the far-right cannot be totally attributed to the rise of UKIP, however. UKIP’s surge came at a time when major far-right organisations were beleaguered by internal disputes and leadership crises, and its support from elements of the far-right is in part a reflection on the lack of a viable alternative for fascists. While UKIP has been gaining momentum between the 2010 and 2015 elections, the BNP has been left in turmoil by the departure of its two leading figureheads. Former-MEP Andrew Brons resigned in 2012 following a leadership challenge on Nick Griffin, and Nick Griffin was expelled in 2014 for ‘factionalism’. The EDL fell into total disarray when its leader and founder Tommy Robinson resigned in 2013 over growing extremism within the organisation (it now exist as a collection of splinter groups). Britain First’s former leader Jim Dowson also left the group he founded in 2014 for similar reasons, and new leader Paul Golding has failed to make much of an impact. Had the collapse of these organisations not coincided with the rise of UKIP, perhaps the threat posed by the far-right would be to the scale of what we’ve seen in the rest of Europe. If UKIP starts losing traction however, or it shifts towards the political mainstream, there is certainly room for fascism to rear its ugly head once more. After studying English Language and Literature at King’s College London, Tanya moved to Japan where she teaches English. She loves to read and write, and loves tea almost as much. She is strongly interested in cultures and social structures.